There are tons of stories in the media about overweight pets but rarely are we told how to fatten up a cat that needs to gain weight. In this article, we will look at the possible causes of weight loss in our feline friends. We will also explore options for how to make a skinny cat gain weight. How much your cat should weigh depends on her age, breed, activity level and overall health. The average housecat weighs about 10 pounds. But some breeds may weigh half that much even fully grown. And some breeds may be healthy at more than twice that weight. For most cats, you should be able to feel their ribs and backbone, but you shouldn’t be able to see them. You can use a weight calculator to check if your cat is too skinny. But the best way to know if your cat needs to gain weight is to talk with your vet. Healthy adult cats tend to stay pretty much the same weight over the years. Therefore, if your cat is losing pounds, they may have an underlying medical problem. Gastrointestinal disorders such as gastroenteritis, diarrhea, constipation, and pancreatitis are common in cats. Many can be cured easily over a few days. Others, though, may require long-term management. Internal parasites are also common in otherwise health cats. Parasites can be wormlike or single-cell microscopic organisms. Wormlike parasites include roundworms, hookworms and tapeworms. Isospora and giardia are examples of microscopic organisms. Just like us, aging cats are prone to dental disease. Sore teeth and gums are likely to put your puss off of her food. This disorder is very common in older cats and is caused by an overactive thyroid gland. Symptoms usually include increased appetite, sometimes with vomiting, along with weight loss. Also often seen in aging cats, diabetes can have symptoms similar to hyperthyroidism, such as increased appetite and weight loss. Increased thirst and urination are also commonly seen. Kidney disease is another cause of weight loss in aging cats. Symptoms for this condition also include increased thirst and urination. 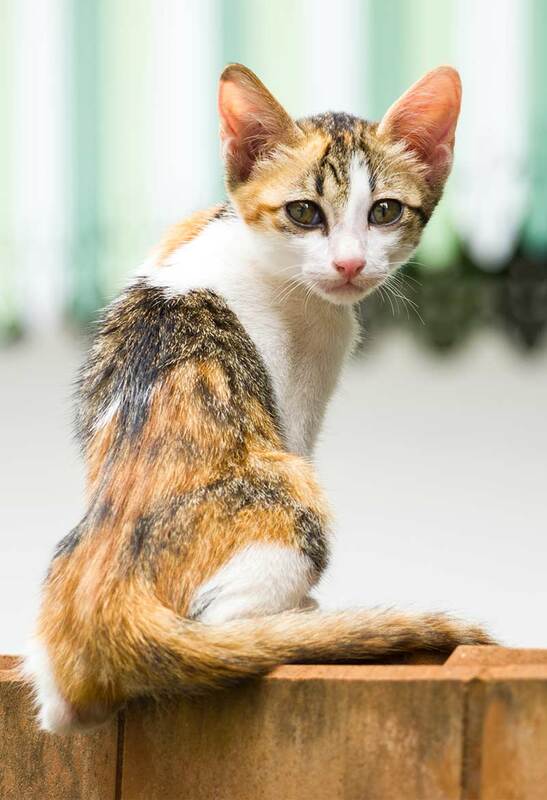 Your cat may show show signs of bloody urine, vomiting and diarrhea. Sadly, cancer and tumors are the number one cause of fatality in cats. If your cat is losing weight, it could be a sign of a gastrointestinal tumor. A senior cat may experience difficulty in actually getting to the food bowl, especially if she is suffering from arthritis or failing sight. It could be that your pet’s sense of smell is not as good as it used to be. Her dinner may just not have such an appealing aroma these days. It is possible that medication may affect a cat’s appetite. Talk to your vet, though, before changing the dose or stopping any prescription medications. A change in diet could be the answer to how to make a skinny cat gain weight. A new food that is tastier or even has a different texture may encourage her to eat more. The nutritional content of the food is important, too. Check with your vet before making a big change in your skinny cat’s diet. It is also important that any changes are made slowly to avoid gastrointestinal distress. So let’s look at foods that should help with weight gain in cats. Nature’s Variety Instinct is high in animal protein, grain-free and low in carbohydrate. It also contains freeze-dried raw meat to boost nutrition. Other beneficial components are probiotics, omegas, and antioxidants. Kitten food contains higher levels of protein and fat than adult alternatives. It is deliberately highly calorific to support kittens’ rapid growth. This means it can play an important part in how to fatten up a cat. This kitten food from IAMS contains a decent 41% animal protein for great taste and aroma. It is easy to digest with prebiotics and has omegas for brain and eye function. Antioxidants boost defenses and taurine help with vision and eye health. Although dry food generally contains more calories than wet, wet food is sometimes a better option. Elderly cats in particular sometimes become more vulnerable to urinary tract infections. Hydration is not only part of how to help a cat gain weight, it helps protect the urinary tract. Wet foods help keep water intake as high as possible. A good wet high-calorie cat food for senior cats is Blue Wilderness grain free wet cat food. This has a high concentration of tasty chicken and is 100% grain-free. It is also fortified with vitamins and minerals including taurine. Made with real sardines, this food is high in protein and fat rich. It also boasts zero carbohydrates for a truly feline-appropriate meal. A cat weight gain supplement is another idea when wondering how to fatten up a cat. These products might help your cat gain weight. But get your vet’s approval before you try any of them. This gel-like substance is very palatable and high in calories. It provides appetite stimulation to help with your cat’s desire to eat. Also contained are concentrated sources of vitamins, minerals, and omegas. Treats are another highly palatable way to get those hunger juices flowing. This is a moisture filled blend of chicken and tuna flakes together with sauce so your cat can simply lick-away to her heart’s content. It contains vitamins such as E and B to support senior health, too. Some other short term sources of cat food for weight gain come from our own pantries. Eggs are a good choice and are high in protein and calories. Canned fish is usually accepted and is a valuable source of nourishment. These human foods should be offered without seasonings and flavorings that can make your cat ill.
And they shouldn’t be used as a long term replacement for a complete prepared cat food without your vet’s blessing. Try splitting your pet’s food into several smaller meals throughout the day. Some cats prefer to eat little and often, but notice immediately when a previous meal has been allowed to stale. Warming food can also help stimulate a cat’s appetite. Warm food is more aromatic, which makes it more appealing if your cat’s sense of smell is fading. Take care, though, to check to temperature before feeding. Make sure the food bowls are clean. 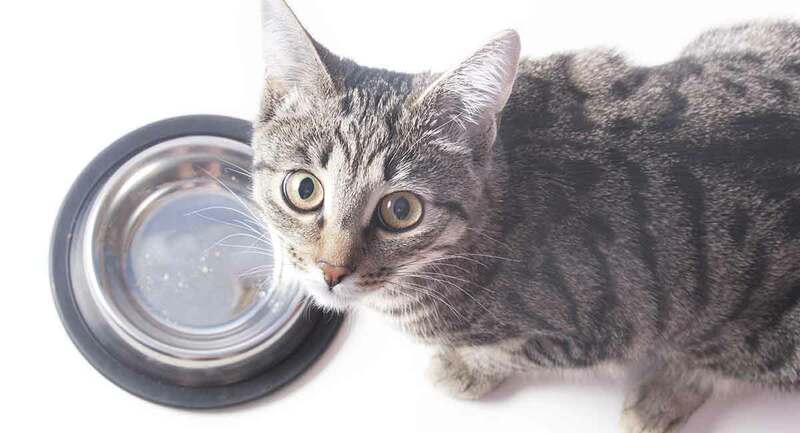 Your pet, quite justifiably, is unlikely to want to eat from a dirty bowl. We hope we have helped you with how to fatten up a skinny cat. We have learned that foods high in calories and fat are useful when considering how to make a cat gain weight. Kitten foods are typically the most fattening cat food. So your vet might recommend them to help an elderly underweight cat, too. It is important to remember that the best food for an underweight cat is one with as many animal ingredients in it as possible. Plant-based products should be avoided or at least kept to a minimum. Above all, if your cat is losing weight, take her to your vet for a comprehensive check-up before you do anything else. Even the best when a cat needs to gain weight can’t help if there’s an underlying medical problem that still needs to be treated. Make sure that you discuss any dietary changes with your vet as some conditions require a special diet. If you work closely with your vet you are bound to find a way to help your cat gain weight. Have you had trouble getting your cat to eat? Does kitty keep on losing weight whatever you do? We would love to hear your stories in the comments below. Marsilio S. Gastrointestinal disorders in cats. Veterinary Medicine & Biomedical Sciences, 2016. McGlade T et al. Gastrointestinal parasites of domestic cats in Perth, Western Australia. Veterinary Parasitology, 2003. Kornreich B. Feline dental disease. Cornell Feline Health Center. Peterson ME. Hyperthyroidism in Cats. Clinical endocrinology of companion Animals, 2014. Rand JS et al. Canine and feline diabetes mellitus: Nature or nurture? The Journal of Nutrition, 2004. Chronic kidney disease. Cornell Feline Health Center, 2014. Cribb AE. Feline gastrointestinal adenocarcinoma: A review and retrospective study. The Canadian Veterinary Journal, 1988.